Are there any foods that cause acid reflux? Many acid reflux sufferers ask this question. The truth is that while acid reflux causes are complex and multiple, certain dietary patterns may be one of the contributing factors that trigger acid reflux. There are quite a large variety of foods that can trigger acid reflux. It however does not mean that even putting your tongue to taste a particular variety of food would cause acid reflux. It needs to be underlined that in our stomach is present a quantum of acid, but it does not cause acid reflux. It is not a poison waiting for an opportunity to strike back and start eating into vitality of your life. The acid present in the stomach helps in breaking down the food that you eat and catalogues and sends them into the respective departments to provide you the energy to carry on a day-to-day basis. While there are in existence quite large varieties of foods that may trigger acid reflux symptoms, the manner in which you eat the food also contributes to acid reflux. To bring the incidence of acid reflux under control, from your side do ensure that the food that you eat is chewed properly. If you have the habit of consuming large quantities of liquids between the foods, then the liquid be it water or the juice or an aerated drink would come under the category of foods that trigger acidic reflux. If you are in the habit of drinking water, then induce a change in your consumption pattern and consume it either half an hour before you are going to eat the food, or half an hour after you have eaten it. The change in consumption of water is one step forward towards the adoption of holistic manner in which acid reflux can be kept under control. Snacking in any form through out the day would also come under the category of foods that may cause acid reflux aggravation. Ideally to keep acid reflux under control, approach it in a holistic manner and that would be to keep a gap of not more than four hours between one meal and the other. The foods that trigger the acid reflux should not be blamed for the incidence as the incidence of acidic reflux has the occurrence on account of quantity of food that you consume. There is a very interesting classification of food in the Indian mythology which if followed is able to bring down the incidence of acidic reflux to a largest extent. The food in the Indian mythology that is considered akin to holistic is satvic or the pure food. It has been proved that consumption of satvic food is akin to having approaching the issue of food in a holistic manner and would help check the incidence of acid reflux. 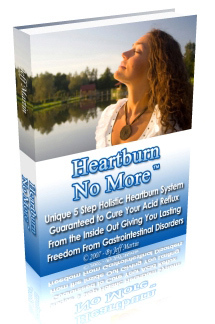 Click Here To Download The Only Holistic System That Cured My Severe Acid Reflux!